A classic route through Canada’s West, featuring the mountain resorts of Banff, Jasper, Sun Peaks and Whistler, together with the beauty of Vancouver Island. This 15-day journey begins on the West Coast of British Columbia with stays in both Victoria and Tofino, with activities that highlight this stunning Coastal region. The mountain resorts of Whistler and Sun Peaks are next with soft adventure activities that emphasize the rugged terrain of the mountains. Your journey continues across the border into Alberta and scenic Jasper National Park in the heart of the magnificent Canadian Rocky Mountains, offering a selection of activities from horseback riding, rafting, cruising and motorcoach touring. A canoe rental on Emerald Lake is followed by a visit to Banff National Park where again you can choose an activity depending on you preference. On your last day take the picturesque drive into the “Stampede City” of Calgary where your journey ends. Arrive in Vancouver and collect your rental car for your journey to Victoria, including a 90-minute ferry ride through the scenic Gulf Islands. Journey time to Victoria is approximately four hours without stops. If you are arriving from an international flight or in the late evening we suggest you overnight in Vancouver prior to commencing your journey. 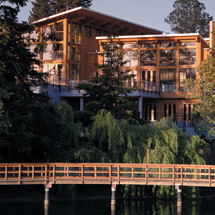 Brentwood Bay Lodge & Spa, Victoria’s only five star oceanfront resort provides understated elegance and discerning service. Located on pristine Brentwood Bay, your Ocean Suite offers inspiring views from every vantage point. Overnight at Brentwood Bay Lodge & Spa. Today you will be able to choose from several tour options, including a Butchart Gardens and city tour, whale watching, Afternoon Tea at the Fairmont Empress, mountain biking, kayaking or flightseeing. Your activity can be booked on arrival in Brentwood Bay, allowing you the flexibility to choose based on operation, weather conditions and personal preference. Overnight at Brentwood Bay Lodge & Spa. Join the Island Highway north to Nanaimo, then west to the Island’s Pacific Coast and the town of Tofino. With sightseeing stops, we recommend allowing six hours for today’s drive. 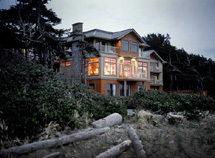 Long Beach Lodge is a luxurious resort set amongst towering trees, overlooking a rugged coastline and long sandy beach. First-class service will welcome you to a relaxed, informal setting, where you enjoy exhilarating activities or simply put your feet up and gaze out to the crashing surf. Overnight at Long Beach Lodge. 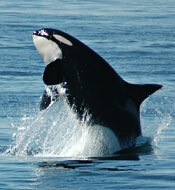 Enjoy a full-day marine excursion to the north end of Clayoquot Sound. Here a short boardwalk trail will take you to natural sulphur hot springs where you can enjoy a truly magical soak. Whales are frequently sighted during the journey, and marine stops may include a sea cave, black bear viewing, an eagle’s nest and a seabird-nesting island. Your journey will be made by covered boat with appropriate clothing provided. Overnight at Long Beach Lodge. Travel back across-island to Nanaimo and board a ferry to the British Columbia mainland. On arrival in Horseshoe Bay drive north on the scenic “Sea to Sky” highway to the mountain resort of Whistler. With sightseeing stops, we recommend allowing seven hours for today’s drive. Overnight at the Nita Lake Lodge. This morning take part in a truly unique experience – a Ziptrek Ecotour. Enjoy an incredible three-hour journey zip lining along a series of suspended cables through the hidden beauty of Fitzsimmons Creek and the picturesque forest valley between Whistler and Blackcomb Mountains. Overnight at the Nita Lake Lodge. Travel across the scenic Duffey Lake Road to the town of Lillooet, the starting point of the old Gold Rush Trail to the Cariboo. From here, drive east through the rugged British Columbia interior towards the resort of Sun Peaks. With sightseeing stops, we recommend allowing ten hours for today’s drive. Overnight at the Delta Sun Peaks. Today you will be able to choose one option from a range of activities. Our local operator will provide you with options based on weather conditions and tour availability, and you have the flexibility to pick a tour based on personal preference. Some of your options include horseback riding, mountain biking, spa treatment or golf. Overnight at Delta Sun Peaks. Leave Sun Peaks and head north through the communities of Clearwater and Blue River to the town of Valemount. Here turn east and pass majestic Mt. Robson, the highest point in the Canadian Rockies at 3,954 metres (12,972 feet), as you cross the Yellowhead Pass into Alberta and on to Jasper. With sightseeing stops, we recommend allowing seven hours for today’s drive. Nestled on a terraced hillside, every room at Pyramid Lake Resort offers a panorama of Pyramid Lake and the Canadian Rockies. Immerse yourself in the luxury, tranquility and natural beauty of this region. Overnight at Pyramid Lake Resort. Included with your stay in Jasper is a choice from a range of activities that showcase Jasper’s unique beauty including cruising, rafting, motorcoach touring and horseback riding. Your activity can be booked on arrival in Jasper, allowing you the flexibility to choose based on operation, weather conditions and personal preference. The rest of the day is free to explore Jasper National Park with your rental car. Among the highlights are Pyramid and Patricia Lakes, Maligne Canyon, Miette Hot Springs, Maligne Lake and the Jasper Tramway. Overnight at Pyramid Lake Resort. Travel to Emerald Lake via one of the most scenic highways in the world, the Icefields Parkway. Spend time at Sunwapta Falls, Athabasca Falls, Bow Lake and Peyto Lake. At the Columbia Icefields you will have the opportunity to ride on an Ice Explorer (not included) to the middle of Athabasca Glacier. With sightseeing stops, we recommend allowing at least four hours for today’s drive. 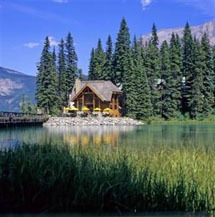 Emerald Lake Lodge is situated on the shores of Emerald Lake in Yoho National Park, and originated as a guesthouse in 1902 with no additional development since the 1920s. Now the area remains one of Canada's most outstanding year round accessible wilderness settings. Overnight at Emerald Lake Lodge. Enjoy the tranquil delights of canoeing with a canoe rental on the serene waters of Emerald Lake. The remainder of the day is yours to explore the sights of Yoho Park, including Takakkaw Falls and beautiful Lake O'Hara, hike in the surrounding mountains or simply relax at the lodge. Overnight at Emerald Lake Lodge. Your journey along Highway 1 to Banff takes you through spectacular scenery. We recommend stopping at Lake Louise en route, and allowing approximately 90 minutes for today’s drive. Tucked away on Tunnel Mountain, Hidden Ridge Resort is quiet and secluded with spectacular views of the Canadian Rockies. Rooms feature wood burning fireplaces, full kitchen and patios or balconies, while the resort offers an outdoor hot tub, covered barbeque and a myriad of hiking trails. Overnight at Hidden Ridge Resort. Included with your stay in Banff is a choice from a range of activities that showcase the highlights of the region, including guided hiking, sightseeing and wildlife viewing. Your activity can be booked on arrival in Banff, allowing you the flexibility to choose based on operation, weather conditions and personal preference. Overnight in Banff at Hidden Ridge Resort. Travel for approximately two hours along Highway 1 to Calgary, where your vacation ends with the return of your rental vehicle.